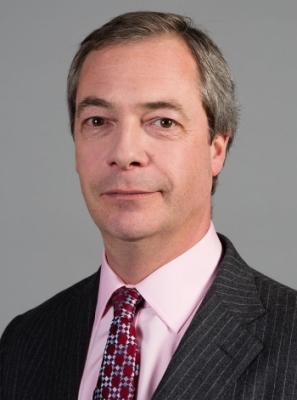 Nigel Paul Farage (/ˈfærɑːʒ/; born 3 April 1964) is a British politician who has been the leader of the UK Independence Party (UKIP) since October 2016 (in an interim capacity), and previously served in the role from September 2006 to November 2009 and from November 2010 to September 2016. Since 1999 he has been a Member of the European Parliament for South East England. He co-chairs the Europe of Freedom and Direct Democracy (formerly “Europe of Freedom and Democracy”) group. He has been noted for his sometimes controversial speeches in the European Parliament and has strongly criticised the euro currency. In September 2006, Farage became the UKIP Leader and led the party through the 2009 European Parliament Election, when it won the second highest share of the popular vote, defeating Labour and the Liberal Democrats with over two million votes. He stepped down in November 2009 to concentrate on contesting Buckingham, the constituency of the Speaker, John Bercow, at the 2010 general election, coming third. In November 2010, Farage successfully stood in the 2010 UKIP leadership contest, following the resignation of Lord Pearson of Rannoch. Farage announced his resignation as leader when he did not win the South Thanet seat in Kent at the 2015 general election, but his resignation was rejected and he remained in his post. In 2016, Farage was a prominent supporter of the successful campaign for a vote in favour of leaving the EU in the UK EU membership referendum. Farage was ranked second in The Daily Telegraph’s Top 100 most influential right-wingers poll in October 2013, behind Prime Minister David Cameron. He was also named “Briton of the Year” by The Times in 2014. Following the resignation of Diane James, Farage became interim leader on 5 October 2016.